Very nice to stay the house , I love the interior designer and good quality breakfasts! Very good location ! Most important thing, one tell staff , maybe is an owner , very friendly and handsome ! Sorry , I forgot to ask the name ! I spent two days here and was satisfied with most of the thing. Even the shower room is small, I think it is common in this country. Since my room is on the top floor, 5th floor, I could have struggled to move my heavy carriage. However a kind staff moved it instead of me, and he refused to receive a tip. Anyway I really liked this cozy hotel. Location, nice hotal staff, breakfast. Everythings is fine for me. A basic and well located hotel in Brighton. Very close to the centre with good views over the sea and the pier. Good basic accommodation. This is a cheap hotel, by Brighton standards. The room I was in was tiny and quite a struggle with a suitcase as it was on the forth floor, although I refused the staff's offers to help, and really could do with being renovated but it was clean and had all I needed. The point about the hotel is its not expensive and it is very friendly. Breakfast is really good, organic bread, home made cakes, free range eggs,ham (good quality), cheese etc etc! No Full English but high quality. Also if you don't know Brighton the location is perfect, central and in one of the classic town squares. I've stayed in many of Brighton's hotels, big chains and B&Bs, and this is by far the best. Great location, near restaurants, shops and parking. However hotel room was tiny with very little hanging space for clothes. As a frequent traveller I would have preferred a cooked breakfast rather than continental. 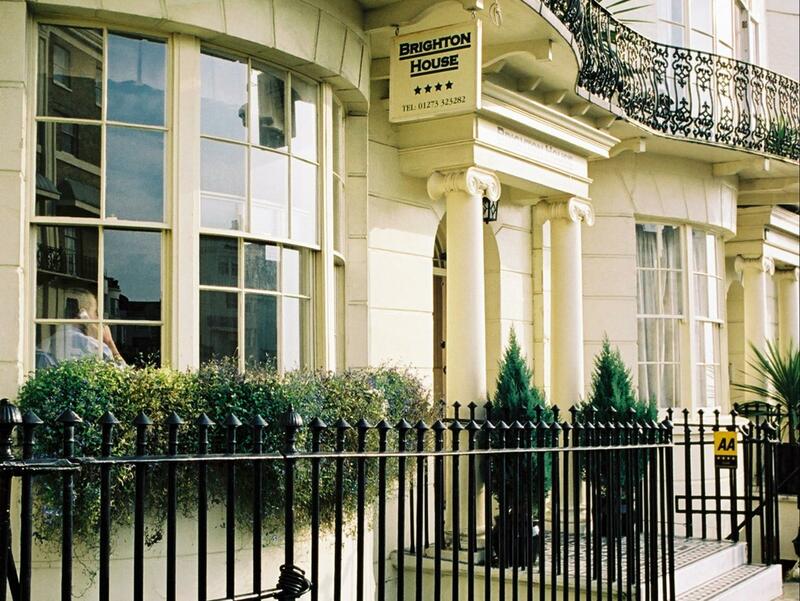 I stayed at the Brighton house hotel for 1 night. The room was nice, well lit, and very clean. Staff were very helpful and attentive. Buffet breakfast in the morning was lovely with all organic, local foods. The only down side was my room was on the 4th floor and there are no lifts. I suggest requesting a lower floor if you have trouble with stairs or large/heavy bags. Great hotel, everything organice. well maintained. only thing is we got a room on the 5th level and there is no lift but the staff are very nice and they helped us with our bags all the way to the top. The breakfast is one of the healthiest and best in quality I have had in a small hotel like this. I would stay there again if i had the chance. Convenient for shops, friendly staff. The room we had was fine. Ensuite bathroom was satisfactory if dated. Public areas will require decorating shortly. As this is an old property the floor in the bedroom was sloping quite significantly but this added to the character of the property. Breakfast was adequate. The room is cozy, and bigger than I expected.Service was great, the staff there are very friendly.A A little bit out of expected that they would prepare homemade organic cakes in the entrance for the guests in the evening.The wifi signal is strong, so you can get connected to the internet very easily.Breakfast is tasty. Very friendly staff, perfect breakfast, nice rooms (loved the balcony!! ),everything in walking distance. A perfect stay! The hotel was located in the Regency Square, which is quite close to the beach, but be able to see the beach from the room very well. We booked a standard double room, but we were very surprised for the size of the bed and the room. We were two small females, so hardly could fit into the bed, but I don't know how two people (especially with male!) can fit into such a small bed... I think that was a single size room. The room was equipped with nice organic tea, but there was no place to enjoy the tea other than bed!! In addition, the view from the room was bad, just a dirty backyard... If you book through the hotel website, the price is different according to the room, but booking through hotel booking website, we cannot choose the room but all SAME PRICE!! I think the room was not worth to the price I paid... The staffs were nice and kind, and this saved our stay in here, but I will definitely not come back to this hotel if I was placed in the same room again.